My family is filled with book lovers. In my house I try my best to make sure I read my son one book a day. Often times he will bring me the book he wants me to read, its so sweet! For Valentine's Day I wanted to review books about loving your kids. This book set is so sweet. Mommy & Daddy Hugs & Kisses is a set of four books by Anne Gutman and illustrated by Georg Hallensleben. I have seen the individual books at the book store and have always wanted to buy them but this is the first time I have seen them as a set. My son loved the colorful illustrations. He adores animals so these books were perfect for him. I loved them for how sweet they are. I love hugs and kisses from my little guy and these books allowed me to act out what the books said. When it said "Mommy Elephant hugs her calf with a squeeze" I would give my little guy a squeeze and he giggled. "Mommy Cat hugs her kitten with a nuzzle" I gave him a nose rub from mine to his and he smiled so big. My son in the last few months has been more affectionate and I adore it. With these books it is a cute little reminder that all creatures need love and show it in their own way. 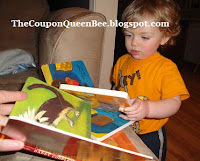 Another great part is the book set included 2 Mommy books and also 2 Daddy books. My husband had a wonderful time reading to our son about Daddy animals hugging and kissing their little ones. He said it was sweet to have our boy sit quietly and smile as he read to him. It seems books are the one thing that mellows out our wild boy. I am sure he inherited that from his Nana! This book set would make a great Valentine's Day gift for any little one and expecting parent. You can find this adorable book set for sale at the publishers website Chronicle Books as well as Target and Barnes&Noble. **This review is my own opinion. I was not paid for this review. The publisher provided for free one box set of the books mentioned in this review for this post.